I wouldn't spend my money on anything else! The fabric is exactly what I need, it stretches and does not get stuck on the velcro of my suit like others. The smallest size is perfect for me (I am very small and it was very difficult to find a suit that fits me). It's soft and makes it easy for you to get into your racing suit. It has two zip heads so you can open it from bottom to top too (this is a plus for men i guess). It is also very easy to wash. Thank you MOTO-D! I was recently wearing a 2 piece underarmour set and I came across the MOTO-D-D 1 piece undersuit and purchased it to try it out. After trying it on and off with my race suit. I would have to say it's totally worth it. The material is great, stretches very well. I like the well vented back for protector and hump. Double zipper front was a great idea. Not having the over lay of the 2 piece I recently worn is great! I noticed no pinching in those areas. Thanks again MOTO-D for another great product. One consideration would be to reinforce the knee area. Reason being is that a lot of times we take our leathers off in the pits but leave this undersuit on while we work on the bike changing tires or something else and we are kneeling. Having a little reinforcement around the knee area would help reduce the possibility of tearing the suit or wearing out the knees. This base layer is incredibly comfortable, you won't believe it until you are wearing it. Before I purchased this base layer i was wearing a 2 piece under armor set that cost me at least $30 more that wasn't nearly as comfortable and this blows that away in functionality (keeping you cool) as well. It is absolutely a game changer and I wouldn't hesitate to buy enough that you can make it a regular component of your gear on every ride wether worn under a suit or not. I am looking forward to trying the undercut for cooler weather when the temperature drops. To add props to the quality of the item the fellas from MOTO-D were on point hooking me up with the right size over the phone with my initial purchase and helping me get receipts and things that I needed after a crash that led to my gear being chopped off in the trauma unit. Good gear and great customer service. 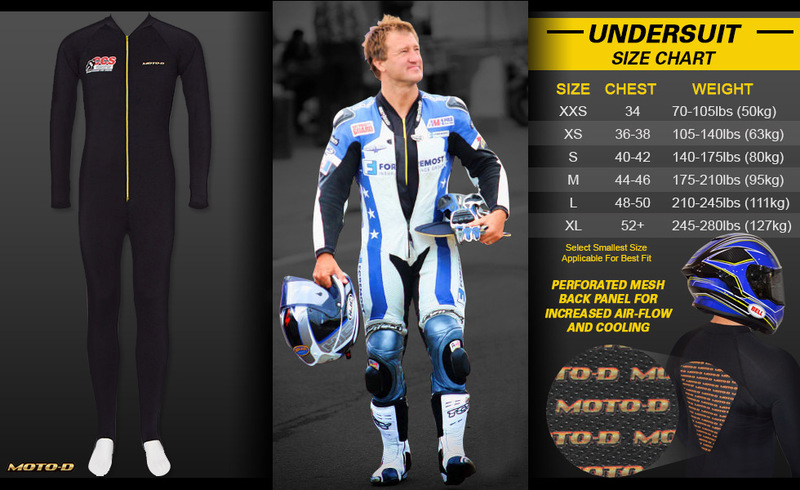 Click the button below to add the MOTO-D "Cool-Tec" Motorcycle Undersuit to your wish list.